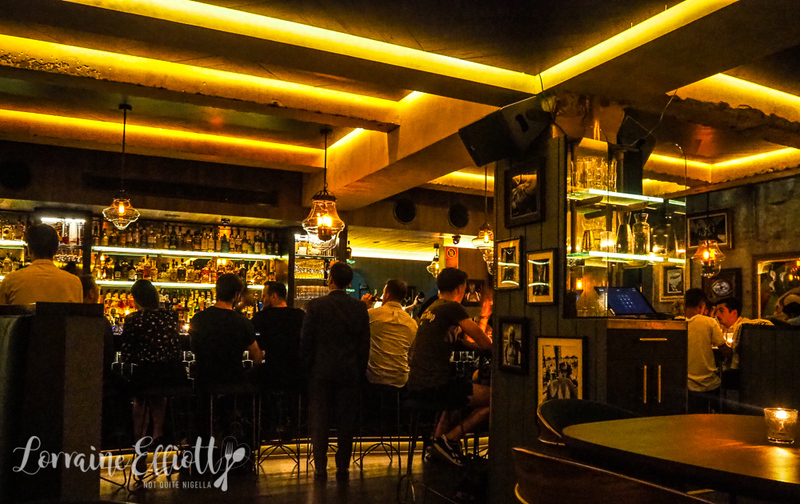 Employees Only is the Sydney outpost of the New York bar. 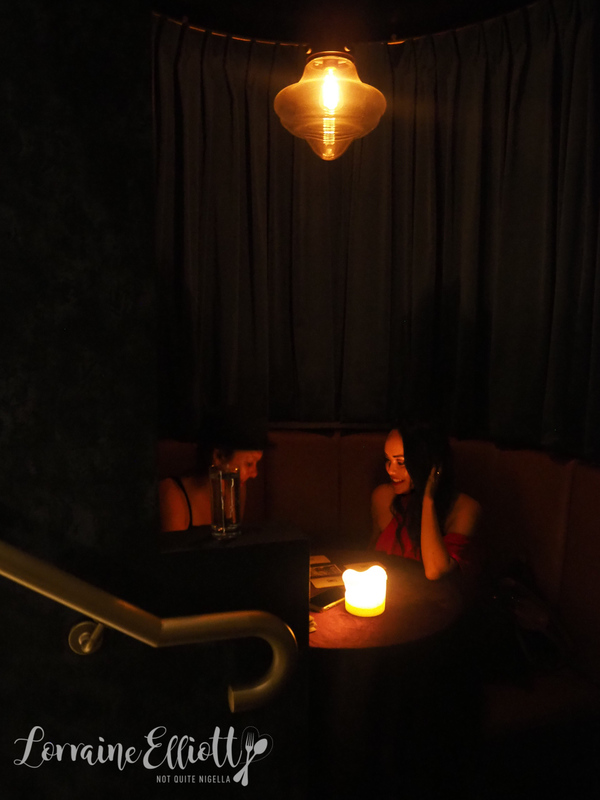 It's a buzzy, subterranean bar complete with a psychic tarot card reader, bar seats, tables and booths. The vibe is buzzy, dark and fun. 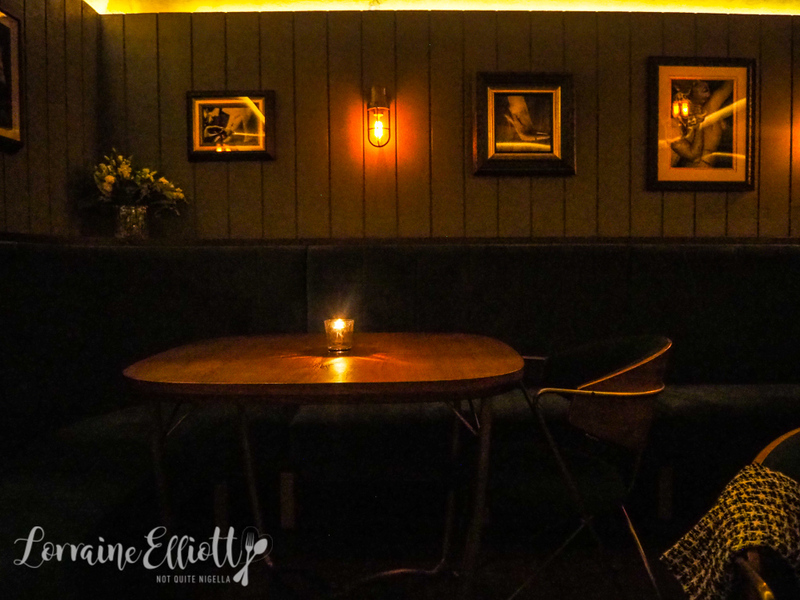 The story goes that Employees Only or EO started as a speakeasy in the West Village by 5 industry friends. 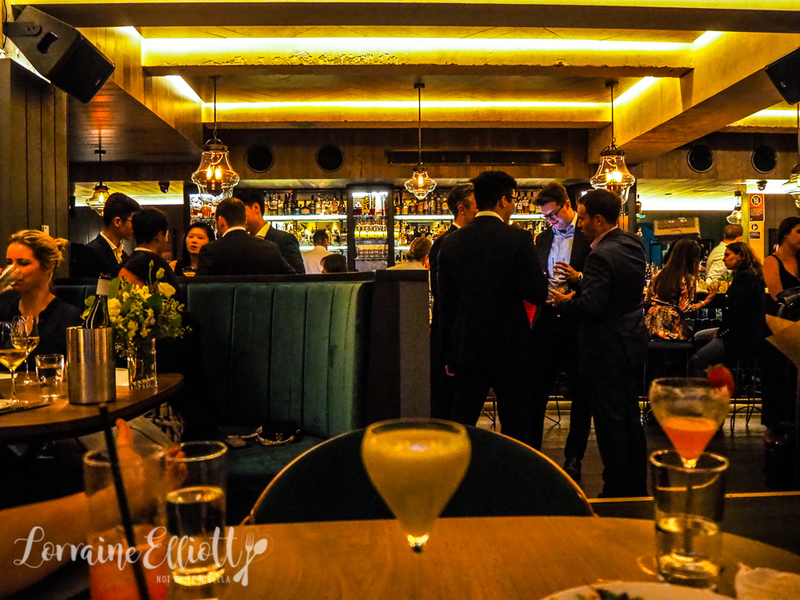 It was meant to hospitality or hospo worker place, open late serving bar food and cocktails and an industry hang. 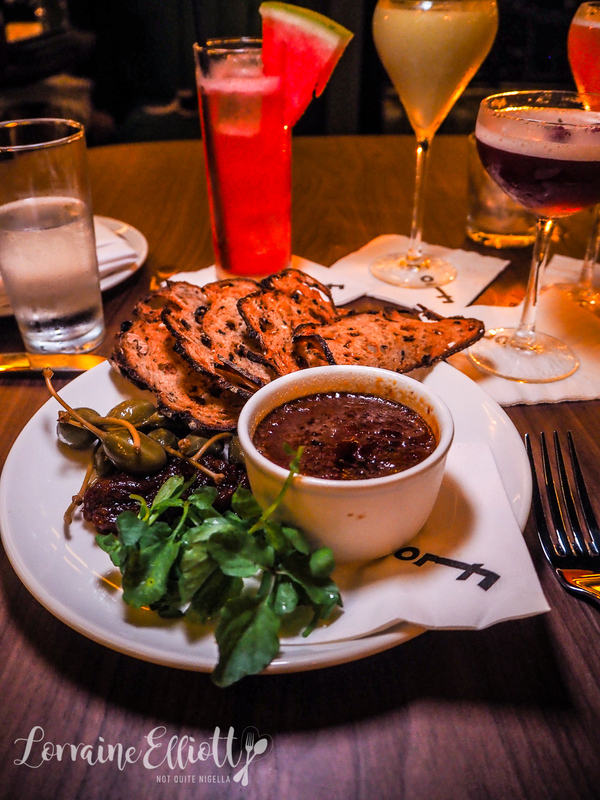 Some of the original's most famous dishes appear here: the steak tartare and bone marrow poppers are two of these dishes. At the Sydney branch there are Australian touches like quandong with many items more for the Australian palate than the American. 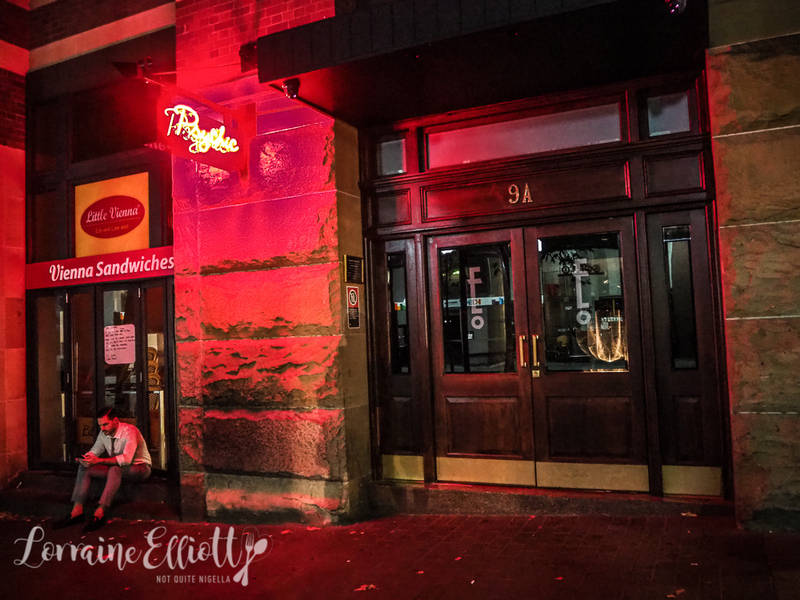 A little tip: if you're going there to eat, you need a booking if you're going on a busy night or earlyish because of the after work crowd. I'm the first to arrive and they show me to a table meant for two. "But there are three of us," I say to her and point at a table for three next to it. There's no way my friends and I are going to fit on a table for two given how much we like to eat. I didn't expect that much food on the food menu, mainly because their Instagram account features a lot of random pics, a couple of drinks and no food. But there are plenty of dishes to choose from and you can have anything from snacks to a full meal. Tonight it's a reunion of the "spice girls" aka the girls from our trip to Dubai this year with Laura my sometime vegetarian friend and Kat. 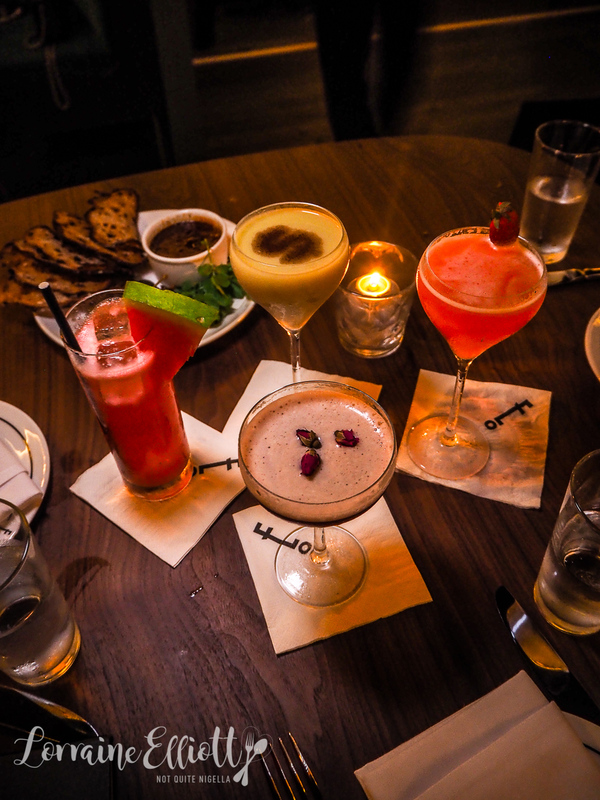 We start with cocktails. For a bar that has won many awards we're expecting some interesting cocktails and they do sound interesting. Kat's Fraise Sauvage with Ford's gin, wild strawberries, Tahitian vanilla, lemon and Ruinart brut champagne is not what we expected. The predominant flavour is lemon while the strawberries are imperceptible. Likewise Laura's Bella Grazia with vermouth, fresh watermelon juice, campari and lemon with tonic is nice enough but doesn't make an impact. For my part I love my cocktail which is the Mata Hari with Martell VS cognac, lemon, pomegranate juice, chai infused vermouth and rosebuds but I think I'm the only one that really enjoys her cocktail. We also ordered The Down Payment "for the table" just because we were curious about the avocado cocktail. There's a dollar sign on top and it's perhaps a millennial joke on the unaffordability of housing due to spend on avocadoes. 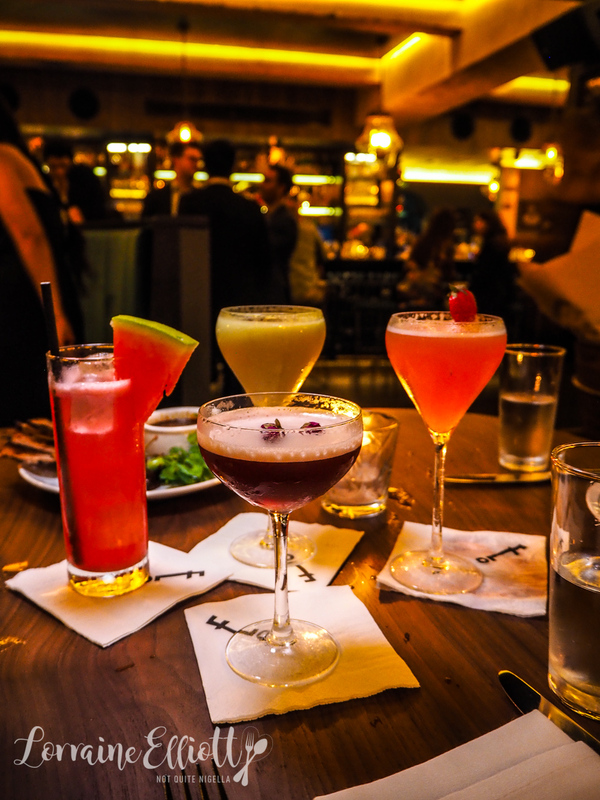 It is made with Pisco, lime, avocado puree with saffron, gentian liqueur and espresso. Sadly none of us go for this at all and it remains largely untouched at the far end of our table, a cocktail leper that nobody wants to drink. The food arrives quickly. The first thing we try is the chicken liver parfait with lacey thin slices of fruit toast and a delectable quandong, rhubarb and beetroot jam with caperberries. This is fantastic, perhaps one of my favourite dishes of the night, the parfait hitting all the perfect notes of flavour and the jam goes perfectly with it. This comes perfectly portioned for the three of us. 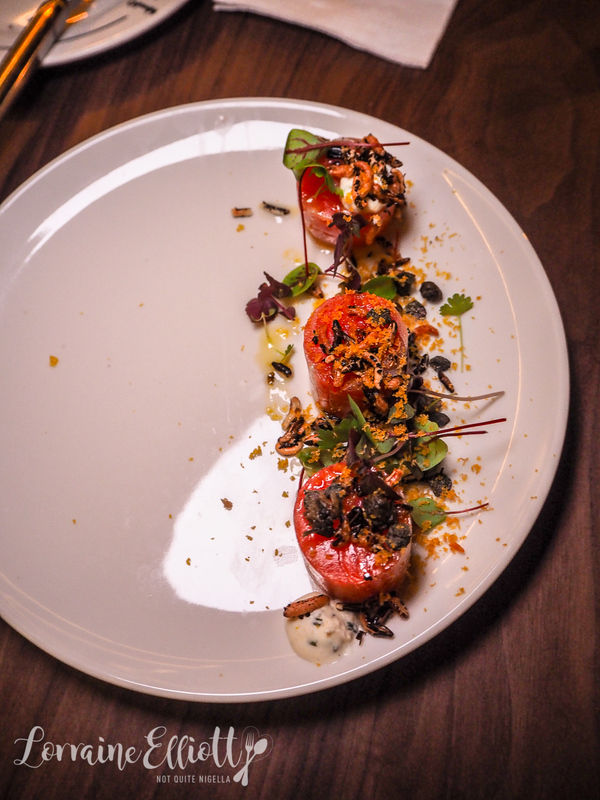 It is slices of curled up citrus cured ocean trout that is served with smoked horseradish, creme fraiche, puffed rice for crunch and capers. It's perfectly tasty and we all enjoy this although I think this is best for sharing. We also couldn't resist the poppers which is actually code for vols au vent. They're meant for one bite lest the oil from the bone marrow drip down your hand (moi? yes). 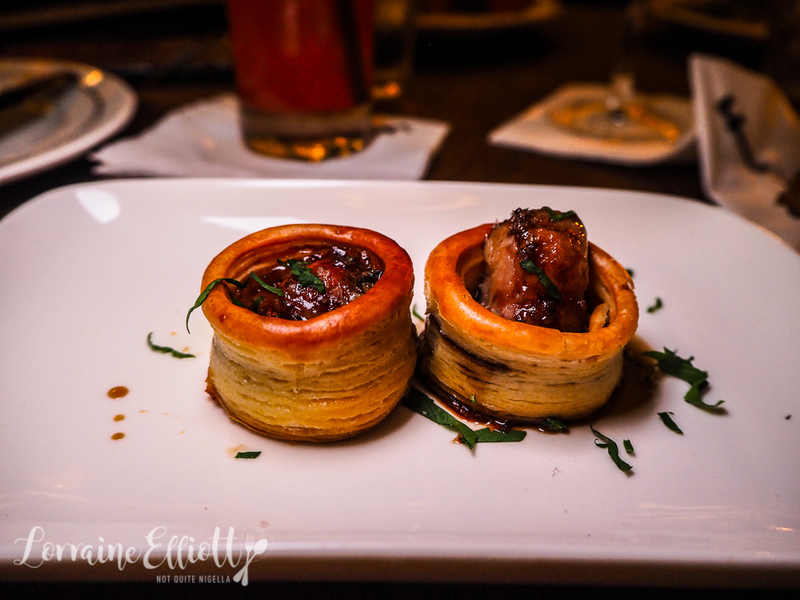 It's a tasty bite and we lament that vols au vent have gone out of fashion. 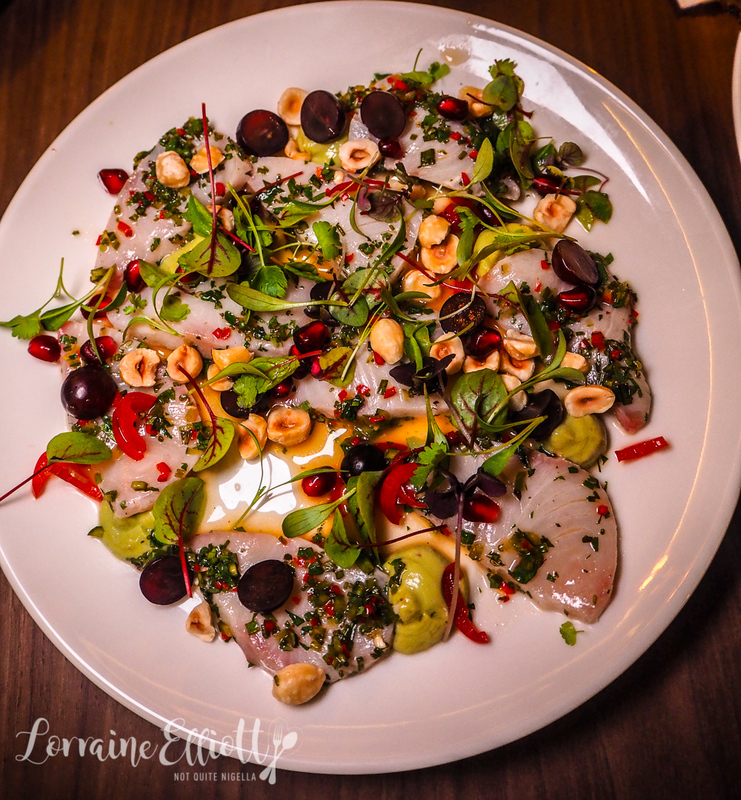 The kingfish ceviche is also deliciously fresh with nice pops of flavour and texture from the pomegranate, grapes and hazelnuts. 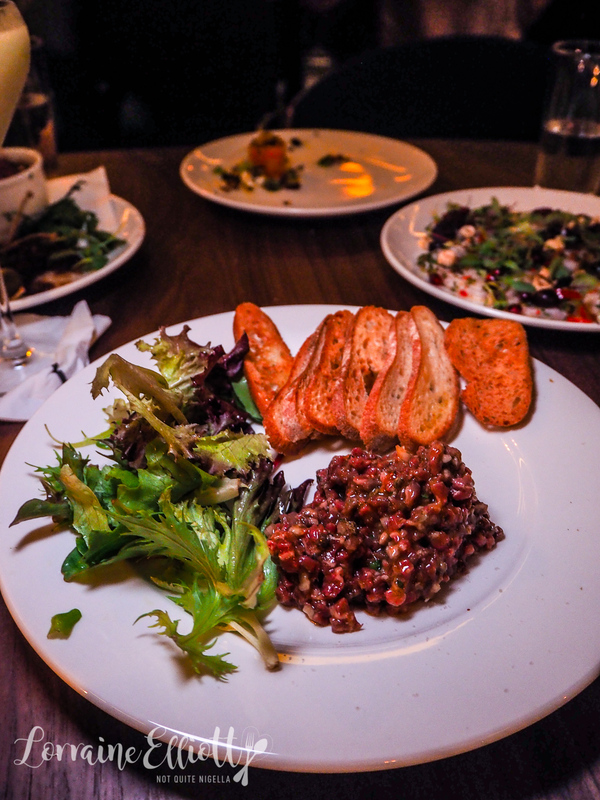 The signature dish on the menu is the hand cut steak tartare. 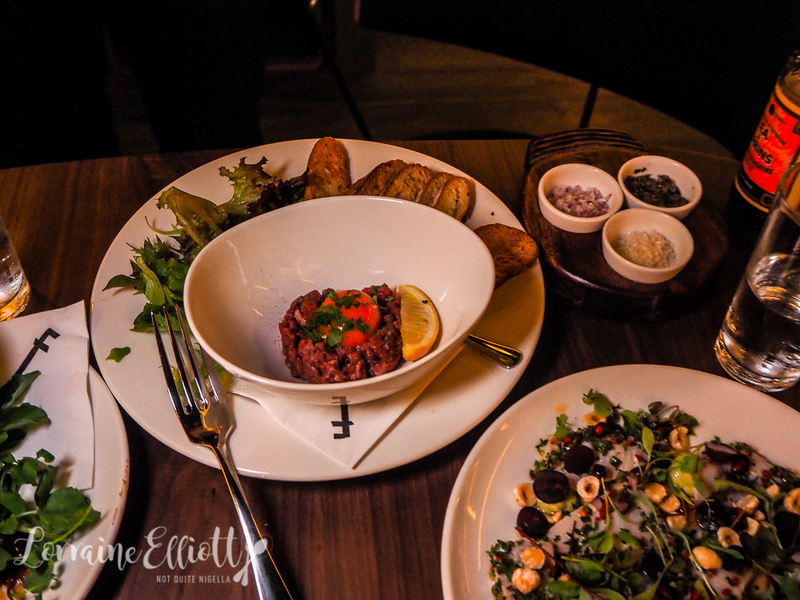 They bring it to a table with a flourish and say, "Welcome to the steak tartare experience!". 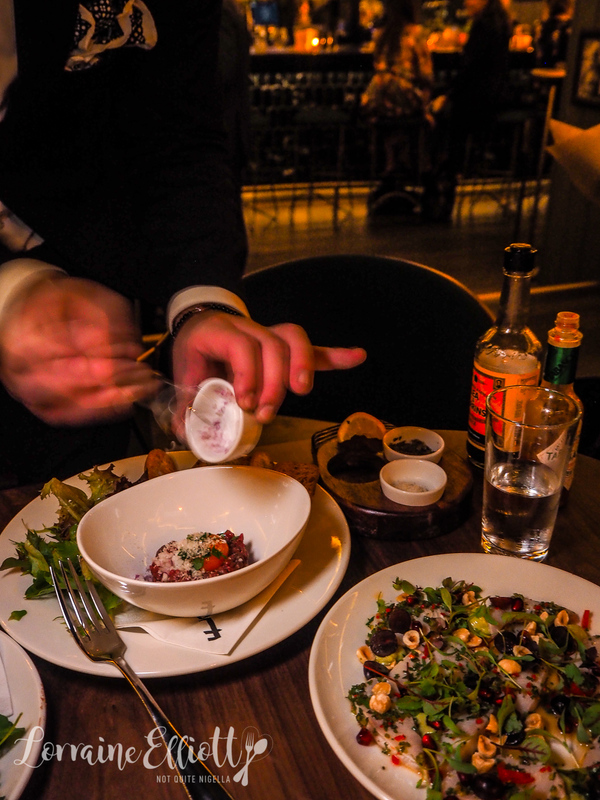 He mixes and commentates the steak tartare ending with a salt bae style sprinkling of salt. It's quite a nice one, quite spicy, perhaps in need of a bit more balance but still quite good. After a bit of a break we decide we could eat a bit more so we order a few other dishes. The spanner crab ravioli is very mild tasting, nage is usually quite a mild broth but needs a bit more pep and flavour and perhaps to be reduced a bit more. 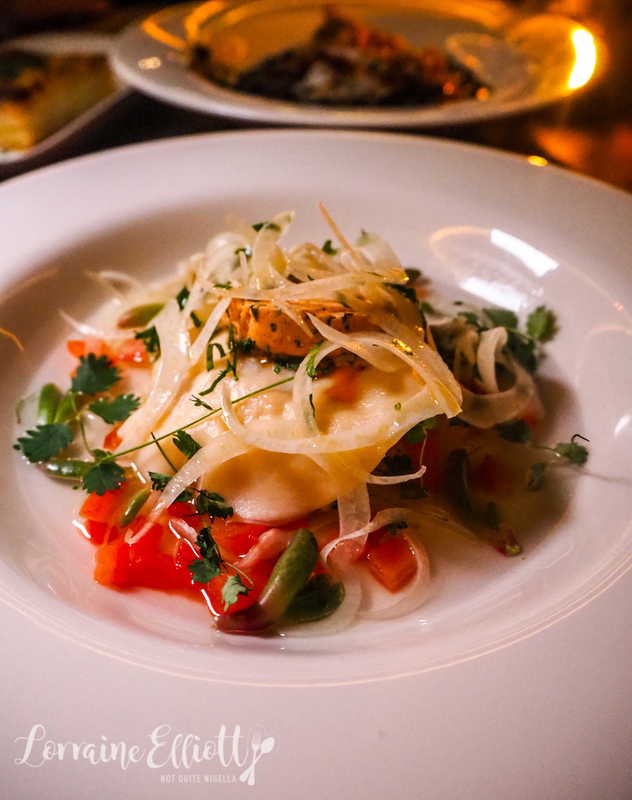 The spanner crab raviolo is nice though and plump with spanner crab. 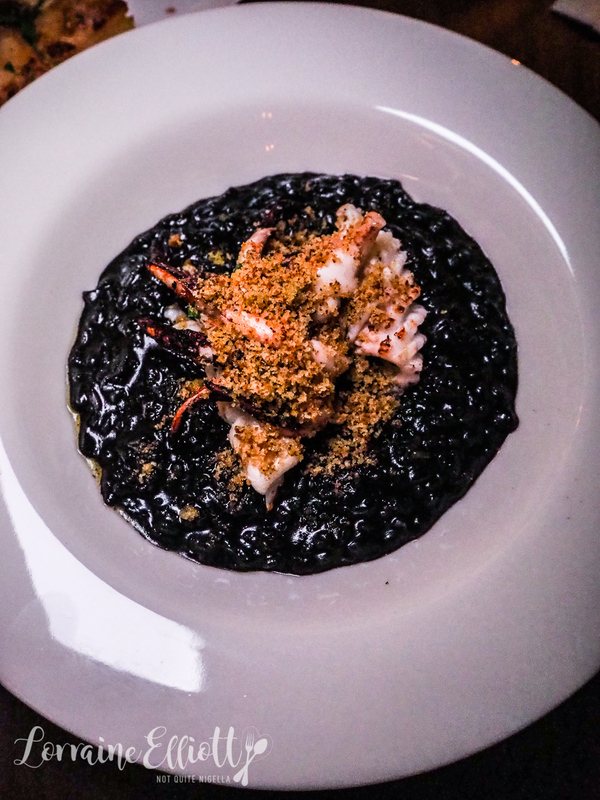 We preferred the squid ink risotto with tender Hawkesbury calamari pieces and a fresh and crunchy lemon pangrattato. I particularly like the calamari in this. 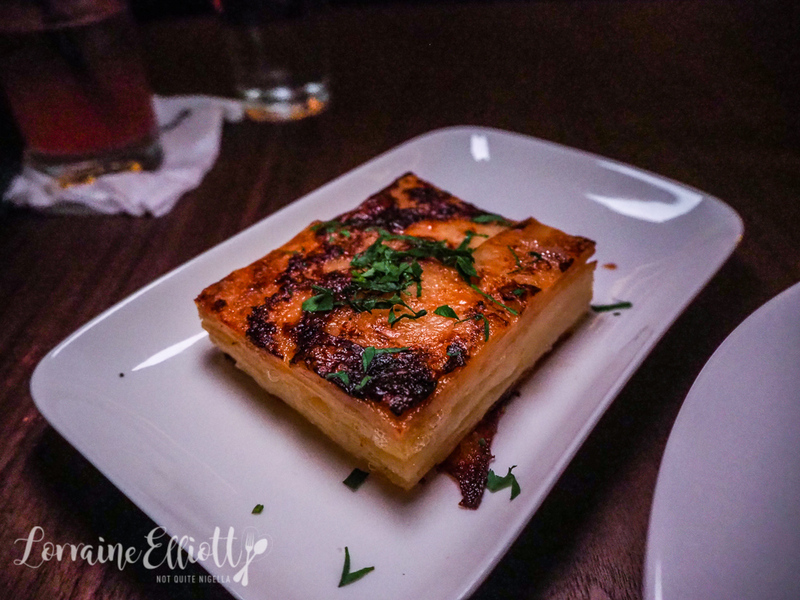 I also enjoy the gratin which is a layered potato gratin with just the lightest touch of horseradish. It's creamy and the potato isn't too soft. We peek in at the psychic who sits in a booth to the left of the stairs down but every time she seems busy. We ask a waitress and she lets us know when she is free - there is no system for seeing her or a place where you can put down your name so at the moment you just have to try your luck. Talis, the fortune teller uses tarot cards. She's from Canada and is very friendly and reassuring, telling me that the cards often have alarming looking images like the death card but that means change rather than actual death. She lays out a diamond pattern of five cards and talks me through them all the while while I'm thinking "That's an awful lot of sword cards I've got." She gives me an insight into my future and my current state and then I ask her some specific questions which she answers through the cards in the deck. Quite happy with my reading, I pay her the $20 (she takes cash or card) and go back to the table. It's dessert time and while we wanted to get on board with the desserts but they didn't really wow us. 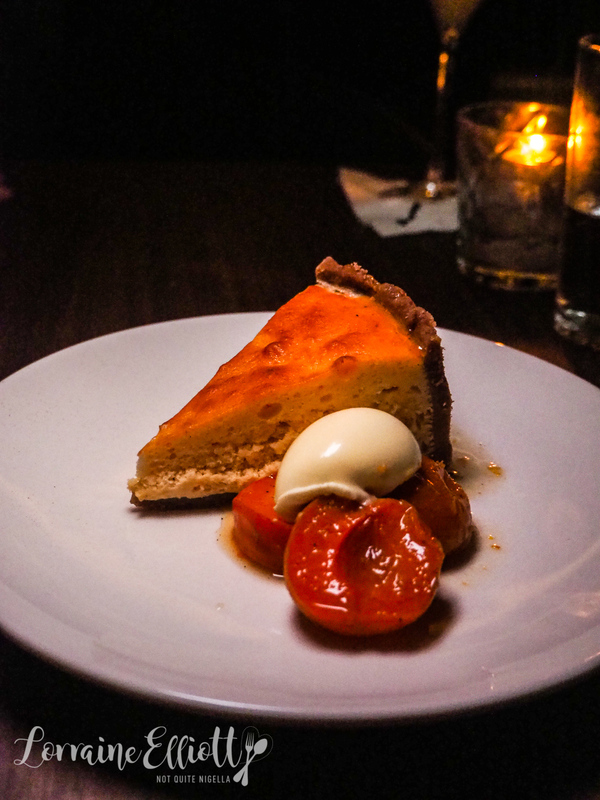 The cheesecake has a grainy texture to it rather than creamy and is sloping and sunken in the centre. 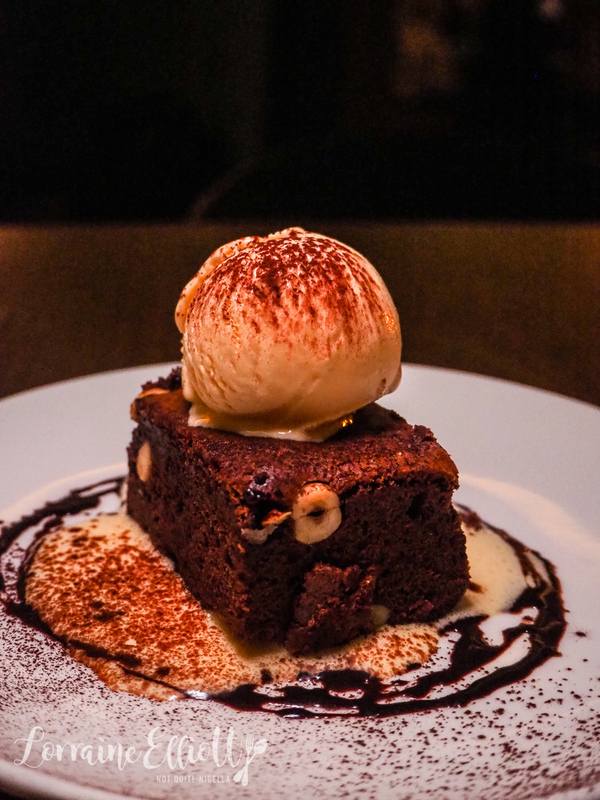 The brownie is more a cake and on the dry side rather than the glorious gooeyness of a traditional brownie and has hazelnuts rather than the pecans described. I do like the white coffee ice cream on top though. Nevertheless, it's around 11pm that we leave. 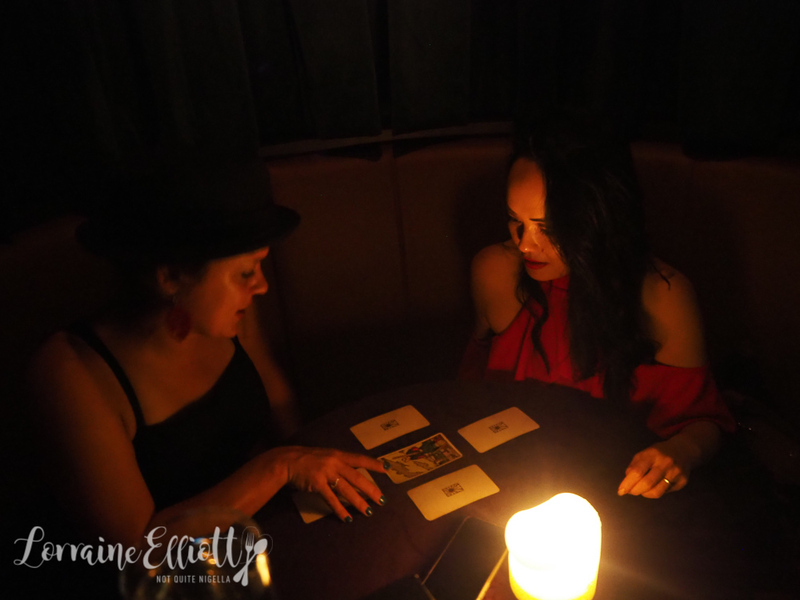 Laura and Kat decide that a visit to the tarot reader is not on the cards and we emerge from the subterranean bar onto Sydney's still busy pre Christmas CBD. So tell me Dear Reader, do you like bars like this? 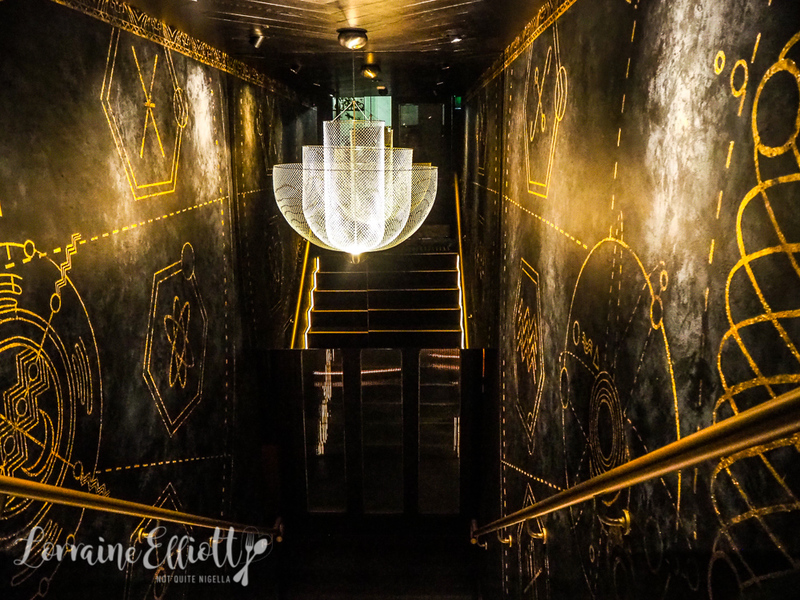 Have you ever been to the original Employees Only and if so, how does this compare? Would you go see the psychic? 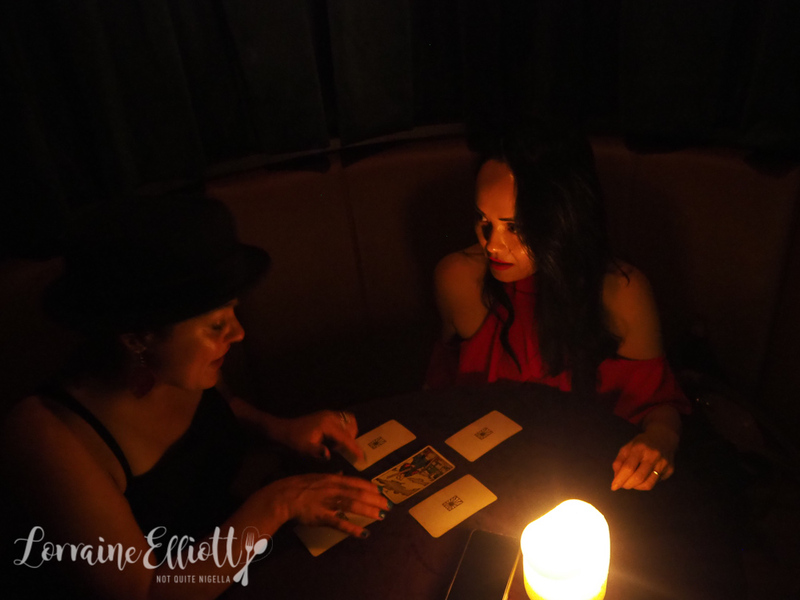 How do you feel about tarot card readings?